Capital One Venture is a program that’s easy to use, allowing you to redeem miles earned with credit card purchases for travel. You can purchase award travel through their shopping portal or erase travel purchases from your statement. Although Capital One Venture miles can’t be transferred to any airline or hotel programs, the strength of the Capital One rewards program is its flexibility. You can redeem miles to pay for nearly any travel purchases made anywhere. There are no blackout dates and no limits. Just buy the travel you want from anywhere and redeem miles to cover the cost. You don’t have to worry about special travel partners or booking through a specific website. It’s just that easy. For every 100 miles you earn is valuable rewards in travel. Since the Capital One Venture Rewards card earns reward miles per dollar spent, that works out to good rewards on all purchases. Using the Capital One Venture card is a great way to rack up a lot of miles without spending your time in the air. New Venture Rewards credit card members will earn 50,000 bonus miles and allow to earn reward miles for every dollar spent on every purchase. bonus miles and earn as well reward miles per each dollar spent. 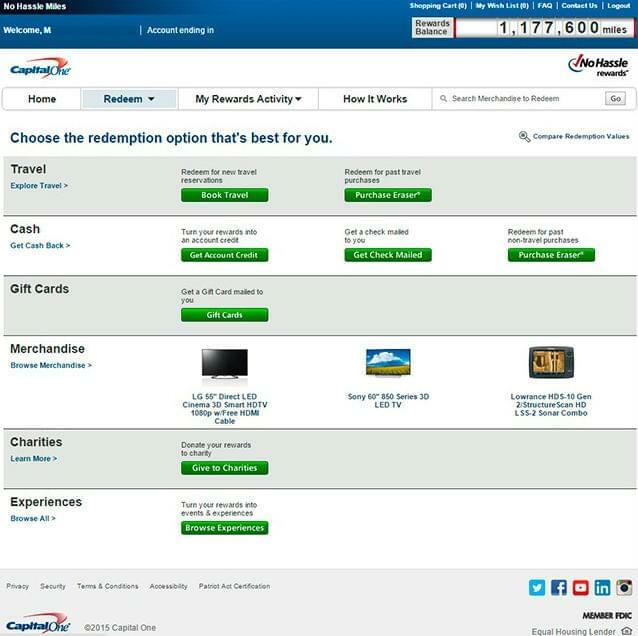 When Should You Use Capital One Venture Redemptions? Capital One Venture Rewards miles are great because you can use them to buy any travel you want. You don’t have to worry about finding award seats with a specific airline or booking through a credit card travel portal. It’s easy and flexible. While you may get more value per point through an airline frequent flyer program, it can be hard to find space at the lowest redemption level. This has become increasingly true over the years, particularly if you often fly economy. That’s why this card is such a useful addition to any wallet. 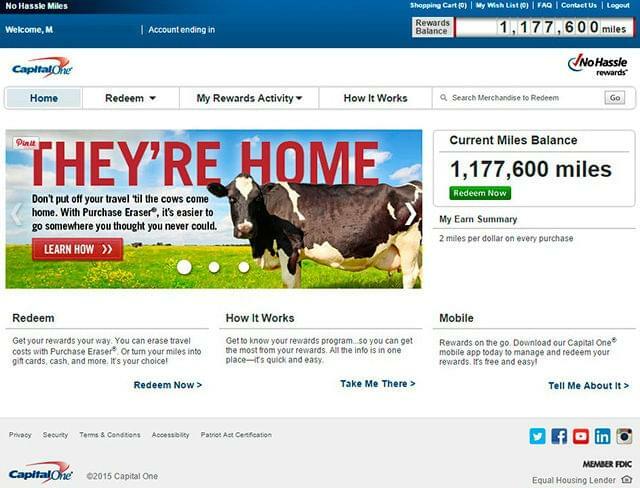 Using Capital One miles is very straightforward. You have two options when it comes to using your miles. You can redeem miles after you make travel purchases, or you can book directly through Capital One travel portal or calling 800-228-3001. When you log on to your account, you are greeted by a screen showing your reward balance. Under “travel” you have two options: “redeem for new travel reservations” and “redeem for past travel purchases.” Choose the first option by clicking on the “book travel” button. 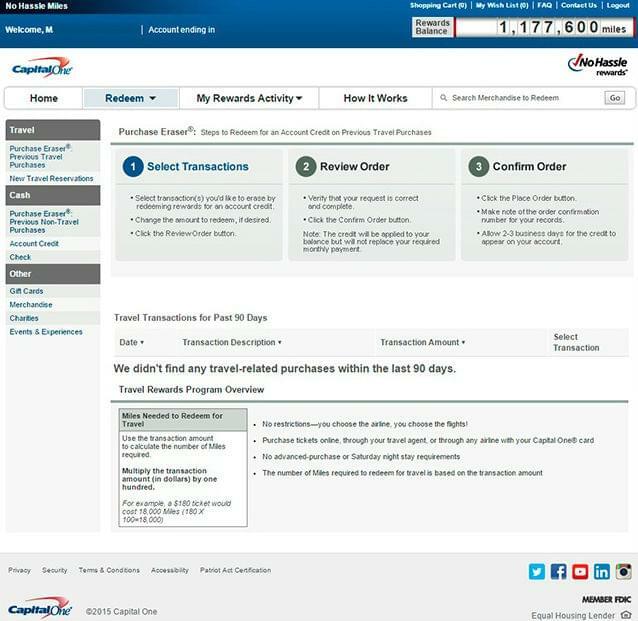 You’ll be taken to Capital One’s travel shopping portal. 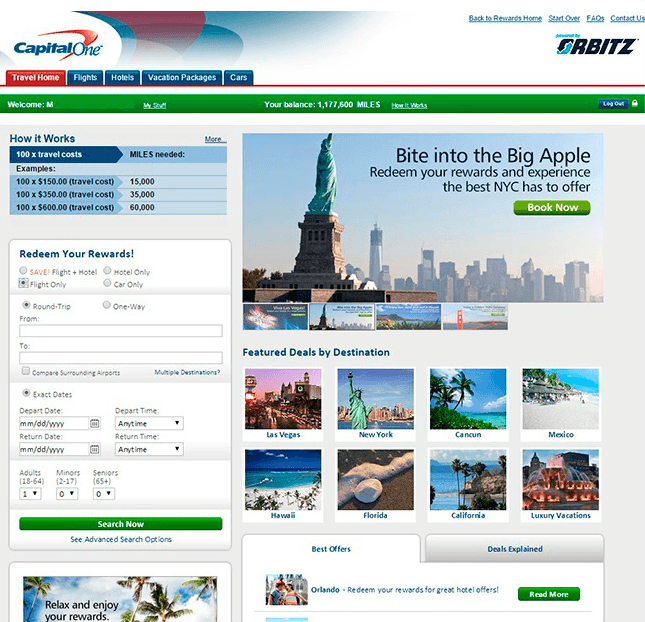 Capital One uses Orbitz for their shopping portal, so their rates are not inflated. If making purchases through Orbitz works for your travel plans, using the Capital One website is a good option for booking travel. Just find the flight, hotel, car rental or vacation package you want, and use your miles to buy it. You can buy travel anywhere if you redeem miles after you make a purchase. The purchases must be eligible travel expenses, including airfare, hotels and car rentals, to get the travel redemption rate. To redeem miles for purchases you’ve made not using Capital One’s travel shopping portal, you’ll use the Capital One Purchase Eraser. • What is the Purchase Eraser from Capital One? This tool purpose is to help you redeem earned miles towards qualifying travel purchases made with your Venture Capital One credit card. • How does Capital One Purchase Eraser work? It filters only “travel-related” goods and services you bought and allows you to refinance them with miles. After you log on to your account, select “Purchase Eraser” under “travel” on the redemption options page. The qualifying travel purchases you’ve made in the last 90 days will appear on the next page, and you’ll be given the option to redeem miles for them at a reasonable ratio. If there were travel purchases, you’d simply click on “redeem now” next to the item and your Capital One Venture Purchase Eraser will use your miles to pay for selected purchases. Note that you cannot pay for part of a purchase in miles, so you will need to have enough miles in your account to cover the full cost. Remember that you must charge your travel expenses on your Capital One Venture card in order for them to be eligible. Capital One miles are extremely valuable because they are so easy to use. You can book any travel from any vendor and use your miles to pay for it. And with the Capital One Venture card is a great entry to the program thanks to its generous sign-up bonus.